Parking Services is responsible for issuing permits, managing parking and enforcing campus parking rules and regulations. UMBC requires that all vehicles parked on campus in non Pay to Park spaces have a valid UMBC virtual parking permit Monday through Thursday from 7:00am until 7:00pm and Friday from 7:00am until 3:30pm. Parking is enforced throughout the year. Visitor parking is available at Pay to Park spaces. Pay Stations for visitor Pay to Park spaces are ADA compliant and visitors with a disabled plate/placard will need to pay when parking in these areas. 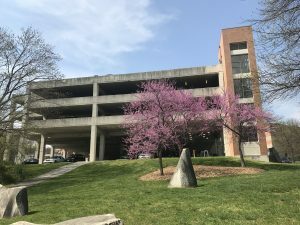 Visitor parking spaces are located at Administration Drive Garage upper level, Commons Garage first level, Walker Avenue Garage upper level, Lot 9 and Lot 7 on Walker Avenue. Visitor parking is $2.00 per hour and payable by MasterCard, Visa or exact currency, no change or refunds provided. Visitor parking is enforced Monday-Friday from 7:00 am until 7:00 pm. We are located in Room 100 of the Facilities Management Building. The building is off Poplar Ave next to the Warehouse. There is short term parking available along the side of the building while you handle your parking transactions.